Male rhinoplasty, also known as a nose job or nose surgery, is becoming increasingly common around the world. It enables men to reshape the nose, leading to an enhanced facial aesthetic. In addition, rhinoplasty helps men correct structural defects in the nose, including those associated with a deviated septum or breathing issues. The CENTER for Advanced Facial Plastic Surgery is proud to offer male rhinoplasty and revision rhinoplasty treatments in the Beverly Hills area. Dr. Babak Azizzadeh is a Harvard-trained and double board-certified facial plastic and reconstructive surgeon who has performed many male rhinoplasty procedures over the years. He possesses the skills and experience to help men achieve the best rhinoplasty treatment results. With male rhinoplasty, men can ensure the nose complements the cheeks, chin, eyes and other facial features. Rhinoplasty has been shown to help men enhance facial symmetry, improve the shape and/or size of the nose, minimize the appearance of imperfections on the bridge of the nose and eliminate the “bulbous tip” of the nose. Rhinoplasty is a complex procedure, and as such, should be performed by an expert. That way, men can receive comprehensive support throughout nose surgery and feel confident they can achieve their desired treatment results. 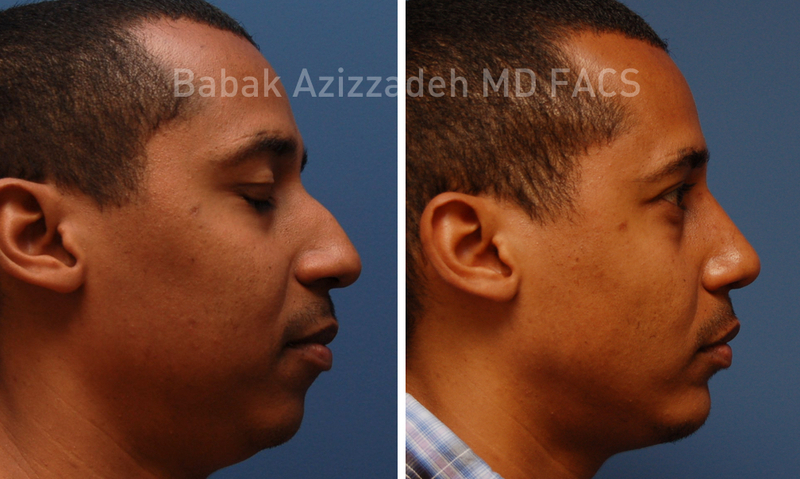 Dr. Azizzadeh takes an in-depth approach to male rhinoplasty. He will meet with an individual, discuss nose surgery options and respond to any concerns and questions. As a result, men are better equipped to make informed decisions about nose surgery after an initial rhinoplasty consultation. How Does Male Rhinoplasty Masculinize the Nose? Male rhinoplasty surgery addresses the unique facial characteristics of men. It is a comprehensive facial plastic surgery that helps a patient masculinize the nose to improve the facial appearance. The male nose commonly features a prominent, straight bridge and a nasal tip that projects at a 90-degree angle between the nose and upper lip. Comparatively, the female nose often features a soft bridge and obtuse angle with the upper lip. Also, in many instances, a man’s nose has a higher bridge and is wider than a woman’s nose. A man’s nose generally has a greater tip projection than a woman’s nose as well. Male rhinoplasty is customized to a man’s facial features. It ensures a patient can benefit from an aesthetically pleasing nose that promotes a masculine appearance. To help a male rhinoplasty patient masculinize the nose, Dr. Azizzadeh first performs an in-depth consultation. He then assesses a patient’s nose and learns about his nose surgery goals. Next, Dr. Azizzadeh develops a custom nose job treatment plan tailored to a patient’s needs. How Does Male Rhinoplasty Differ from Rhinoplasty for Women? Although male and female rhinoplasty procedures are similar, the aesthetic goals associated with these nose surgeries differ. Men frequently undergo rhinoplasty surgery to straighten the nasal bridge and increase the width to the middle of the nose. Comparatively, women often undergo nose job surgery to address a nose that is too wide or a nose that gives the appearance of a droopy tip. Dr. Azizzadeh performs both male and female rhinoplasty procedures. He customizes a nose surgery to each patient and ensures a rhinoplasty helps a patient achieve a balanced and natural-looking facial appearance. Improved Nose Symmetry: An individual can experience the benefits of a natural-looking nose that matches the face. Repair of Structural Defects in the Nose: In many instances, male nose surgery is performed to address structural defects in the nose. Increased Self-Confidence: Male nose surgery can improve the patient’s facial appearance, leading to increased self-confidence. Although male rhinoplasty offers many long-lasting benefits, it is important to note a patient may require several months before treatment results become visible. Dr. Azizzadeh will offer details about what patients should expect from a male rhinoplasty treatment. He will help an individual plan for nose surgery and establish realistic treatment goals. Are You a Candidate for Male Rhinoplasty? Male rhinoplasty represents a major cosmetic surgery, and the decision to undergo a nose job should not be taken lightly. Fortunately, Dr. Azizzadeh will perform an extensive patient analysis to determine if an individual is a viable candidate for nose surgery. Dr. Azizzadeh will dedicate the necessary time and resources to explain how male nose surgery is performed. By doing so, he can teach an individual about all aspects of male rhinoplasty. There is no shortage of facial plastic and reconstructive surgeons available, but none can match the male rhinoplasty expertise of Dr. Azizzadeh. To date, Dr. Azizzadeh has performed dozens of successful male rhinoplasty procedures. He takes a holistic approach to male nose surgery and works with patients to help them achieve the best-possible results. Dr. Azizzadeh understands the male nose and wants a male rhinoplasty patient to enjoy a nose that complements his facial features. To accomplish this goal, Dr. Azizzadeh first performs an extensive patient evaluation. He then collaborates with a patient to craft an effective male rhinoplasty treatment plan. How does a male rhinoplasty differ from a primary rhinoplasty? A primary rhinoplasty is designed to reshape or resize the nose, resulting in an improved facial appearance. A male rhinoplasty is a primary rhinoplasty specifically for the male nose. It accounts for the distinct features of the male nose, including its high bridge and extended tip. Dr. Azizzadeh possesses advanced male rhinoplasty knowledge and expertise. He tailors a rhinoplasty surgery to a man’s nose and facial features. With this approach, Dr. Azizzadeh helps men achieve a natural-looking nose that perfectly complements their facial features. How is a male rhinoplasty performed? A rhinoplasty is an outpatient procedure, and it is usually completed under general anesthesia. Dr. Azizzadeh tailors each procedure to his patient, and as such, rhinoplasty surgery techniques may vary. Dr. Azizzadeh typically uses an open or closed rhinoplasty surgical approach. With an open surgery, Dr. Azizzadeh can precisely modify the nasal tip and middle portion of the nose as needed. Meanwhile, with a closed surgery, Dr. Azizzadeh makes alternations inside of a patient’s nose. Closed surgery is generally used for men who need “bridge” alterations. Can a male rhinoplasty be performed in conjunction with other facial plastic surgeries? For men who want to revitalize their facial appearance, they may consider rhinoplasty surgery, as well as other facial rejuvenation treatments. Dr. Azizzadeh performs a facial evaluation to analyze a patient’s appearance, medical history and treatment goals. In some instances, he recommends male rhinoplasty. Or, in other cases, he may recommend rhinoplasty be performed with an eyelid lift, neck lift or other male facial surgeries. Will my nose job look natural? Male rhinoplasty helps patients bring their facial features into perfect harmony. The procedure commonly helps men improve their profile view and facial appearance. It also enables men to enjoy a nose that is proportional to the cheeks, eyes and other facial features. 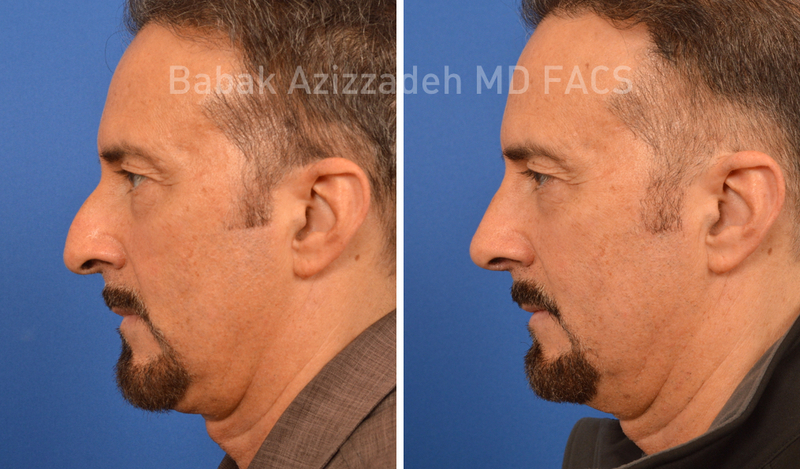 Dr. Azizzadeh understands men’s noses often are wider and higher at the bridge than women’s noses. Additionally, he recognizes that the bone and cartilage of the nose tends to be thicker and denser in men. Dr. Azizzadeh uses a holistic approach to reshape and size a man’s nose. By doing so, he performs male rhinoplasty procedures that deliver safe, effective and natural-looking results. The nose must be fully developed before an individual can receive nose surgery. For women, a rhinoplasty can be performed as early as age 15 or 16. Comparatively, for men, a nose surgery can be completed as early as age 17 or 18. Dr. Azizzadeh is happy to meet with a male rhinoplasty patient and determine if now is the ideal time to perform nose surgery. He analyzes a patient’s nose and other facial features and conducts an in-depth evaluation. If Dr. Azizzadeh determines a patient is a good candidate for a male nose surgery, he will craft a custom nose job treatment program. Can rhinoplasty make my nose look more masculine? 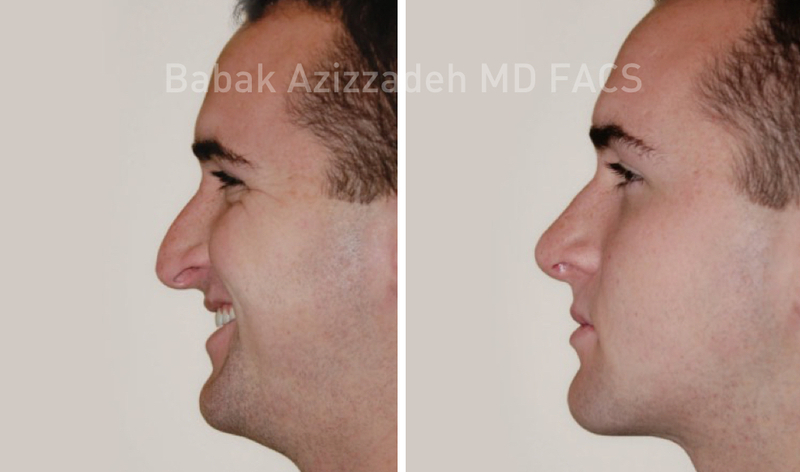 Dr. Azizzadeh strives to ensure male rhinoplasty helps a man achieve a nose that looks and performs great. At the same time, he wants to ensure the procedure enables a patient to maintain the masculinity of the nose. Male rhinoplasty helps a patient achieve a nose that is both aesthetically pleasing and functions properly. In some instances, a male nose job may be used to straighten the nose or lift the nasal tip. Or, in other cases, a male nose surgery may be performed to reduce the dorsal hump. What cosmetic issues can a male rhinoplasty can correct? Are there risks associated with a male rhinoplasty? Dr. Azizzadeh teaches patients about all aspects of a male rhinoplasty procedure prior to treatment. He responds to patients’ concerns and questions and ensures they understand exactly what to expect before, during and after a male rhinoplasty. What will I need to do during the male rhinoplasty recovery process? How long will it take to recover from a male rhinoplasty procedure? The male rhinoplasty recovery period varies. A patient may experience congestion, headaches, swelling and other physical symptoms for up to 72 hours after male nose surgery, and these problems usually disappear on their own. Meanwhile, nose bandages and a nose cast may be removed one week after male nose surgery, and a patient can resume everyday activities at this time. Dr. Azizzadeh typically recommends a rhinoplasty patient avoid strenuous activities for up to six weeks after surgery. He requests patients receive medical clearance before resuming an exercise or workout regimen, too. Patients should expect to see the full results of a male nose surgery within two years of treatment. Dr. Azizzadeh also will perform regular check-ups to monitor a male nose surgery patient throughout the recovery period. Is a male rhinoplasty surgery covered by insurance? If a male rhinoplasty procedure is performed for cosmetic reasons, it is unlikely to be covered by insurance. In this instance, a patient may need to pay the full cost of the procedure out of pocket. Conversely, if a male rhinoplasty surgery is performed to address a functional defect of the nose, an insurance provider may cover some of the costs of the procedure. It often helps to contact an insurance provider prior to undergoing a male rhinoplasty. This allows a male nose surgery patient to learn about his coverage and examine the full cost of surgery. To learn more about male rhinoplasty, please contact us today at 310-697-7149 or fill out our online form to schedule a consultation with Dr. Azizzadeh. Male rhinoplasty, or male nose job, has become increasingly common over the last years, just like its counterpart primary rhinoplasty. Rhinoplasty for men is an incredibly complex surgical procedure, mostly due to the common differences between a male and female nose. The best male rhinoplasty surgeon should be able to increase facial symmetry, enhance masculine facial characteristics, and restore nose function—all of which can provide a boost in self-confidence. The decision to pursue male rhinoplasty should not be taken lightly, and the decision requires quite a bit of diligence on your part to ensure the best outcome. Nose surgery has become exceedingly popular among men. So much so that 1 in 4 of all cosmetic surgical procedures performed on males is rhinoplasty for men. Male rhinoplasty has the potential to bring the male nose into harmony with other facial features, such as the chin, cheeks, and eyes. In addition to enhancing appearance, male nose surgery can also correct nose function in instances of problems such as a deviated septum or nasal polyps. Dr. Azizzadeh is very familiar with the male aesthetic and can provide natural looking, while enhancing masculinity and a burst of self-assurance. One of the most commonly performed procedures in plastic surgery among both men and women is rhinoplasty. As of late, male rhinoplasty has enjoyed an increased prevalence, and all indications are that the numbers will continue to rise. Almost 25% of all elective nose surgery procedures entail rhinoplasty for men, which is either for improvement in appearance or improvement in function of the nose. Whether male or female the surgical technique remains the same, but the very best male rhinoplasty surgeon must understand the idiosyncrasies and fundamental differences between the noses of men and women. Your male rhinoplasty specialist will provide a highly customized treatment plan for your particular male nose job needs. In 2017, a little over 1.3 million men chose to undergo invasive/non-invasive cosmetic surgical procedures. The most common facial surgical procedure performed was rhinoplasty for men. All signs point to male rhinoplasty as an increasing trend, which will only continue into the future. The male nose job has now become commonplace, as men realize that a crooked nose from a previous fracture is not attractive to women and may lead to breathing problems. The best male rhinoplasty surgeon will be able to restore form and function in one of the most technically challenging subsets of rhinoplasty—male nose surgery. Facelift, chin augmentation (mentoplasty), and neck lift were some of the most popular male procedures. Facial plastic surgery, also referred to as facial reshaping surgery, among men is becoming exceedingly popular. Some attribute this trend to “selfie awareness”, which implies men want to look their best on social media platforms, such as Facebook, Instagram, Snapchat, and Twitter. Of these facial reshaping surgeries, male rhinoplasty seems to be the most popular, especially among the 18­–34 year old male demographic. Besides rhinoplasty for men, other increasingly popular cosmetic surgical procedures include facelifts, chin augmentations, neck lifts, and eyelid lifts. It is evident that the facial plastic surgery trend among men will continue to increase.